Life's Journey To Perfection: 2016 LDS Sharing Time Ideas for June Week 3: When I am baptized, I make a covenant with God. 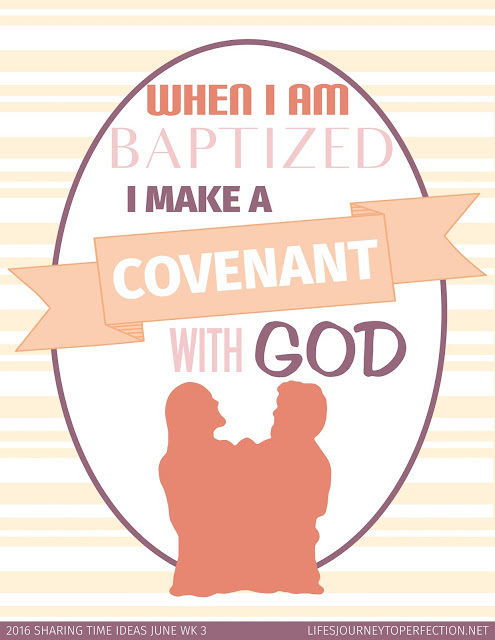 June Week 3 Topic: When I am baptized, I make a covenant with God. 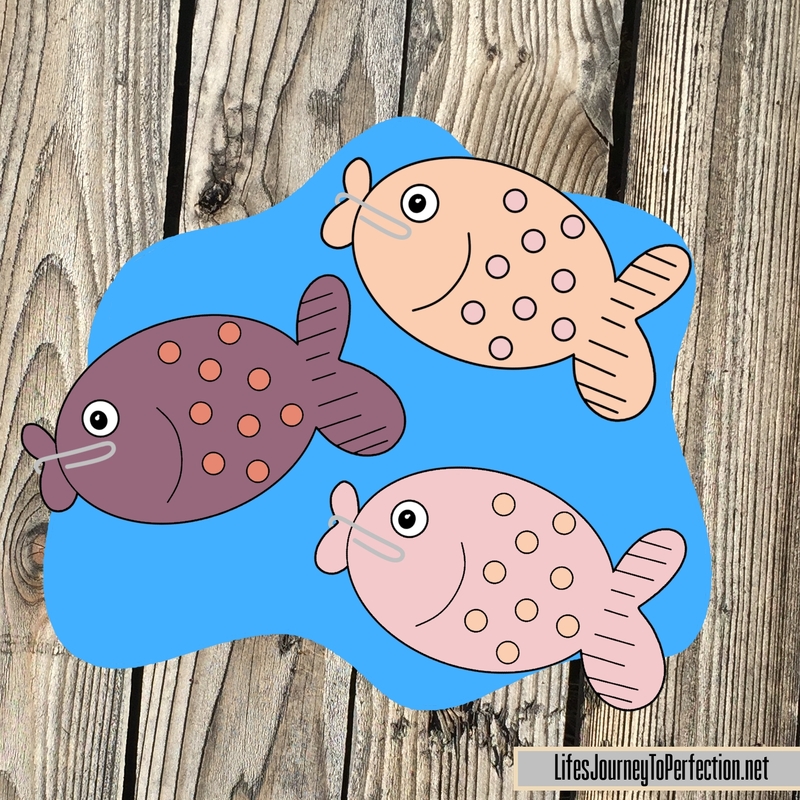 Prepare Fish game, pint fish out onto card stock and cut out. Place a paper clip at the mount of each fish. Make a fishing pole with a wooden dowel, attach a piece of jute at the end (tie it and hot glue it to the pole), long enough for the children to hold the pole and catch the fish. At the other end attach a clothes clip with a magnet on it. Show the primary children a picture of a child being baptized. Ask the primary children what is happening in the picture? Show the week's theme poster and invite the primary children to repeat, "When I am baptized, I make a covenant with God". Show the primary children the "My Promises" stick printable and the "Heavenly Father's Promises" stick printable. Explain that we make promises to Heavenly Father when we are baptized and in return He makes promises to us. These promises are held together by covenant, Place the covenant printable over top of the "My Promises" and "Heavenly Father Promises", binding them together. (You could also do the same thing with two real sticks and then using masking tape or duck tape, tape them together and write the word covenant on it. Explain that you are going to play a little game, on the floor are little fish and on them are written some promises. You will invite a primary child to come up and fish for one of the fish. Once he/she has caught one then he/she will read the promise on the fish, then they will need to decide whether the promise would be a promise we have made at baptism or a promise from Heavenly Father. Once they have decided have them place the fish on the board under either "My Promises" or "Heavenly Father's Promises". Continue until all of the fish have been caught. Review the promises with the primary children. Talk about what each promise means and what they can do to keep their side of the promise. Ask the primary children what happens if they don't keep their promise. Explain that the covenant is then broken and Heavenly Father does not have to keep His promise. Share you testimony of the the importance of the baptismal covenant and keeping our side of the promise. Thanks so much for dropping by!! We hope that these Sharing Time ideas can be used as inspiration for your primary or FHE. We love being able to offer these for free and would love for you to follow us on Social Media too!! The fishing game is so much fun! I love that you incorporated the covenants into the pole. Great game! Thanks for sharing. Thank you for sharing your creativity! You are truly a blessing to me! I love the fishing game! Your illustrations are great too! Thank you so much Jean for such a sweet comment :) Made my day!